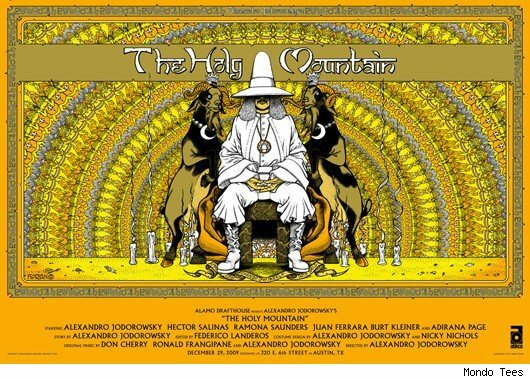 being a huge jodorowsky fan i was stoked when i got the news that this movie is being released on blu ray by severin films.in case you haven`t seen it yet i strongly suggest you check it out. 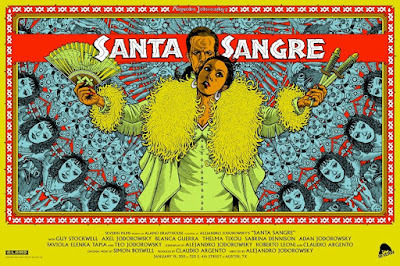 there are few movie makers that make anything so utterly insane and creative as jodorowsky did.santa sangre has been compared to hitchcock´s psycho by critics but the visuals are completely different and unique.if freud was alive he would have loved santa sangre for its rich symbolism and psychological allegories. "The good folks at Mondo commissioned an outstanding piece of art by Florian Bertmer, (who also created this stellar Mondo poster of The Holy Mountain), for the one night only screening of Santa Sangre at the Alamo Drafthouse in Austin TX tonight. Mondo’s posters are printed in very limited numbered runs and are usually gone within minutes of going on sale. 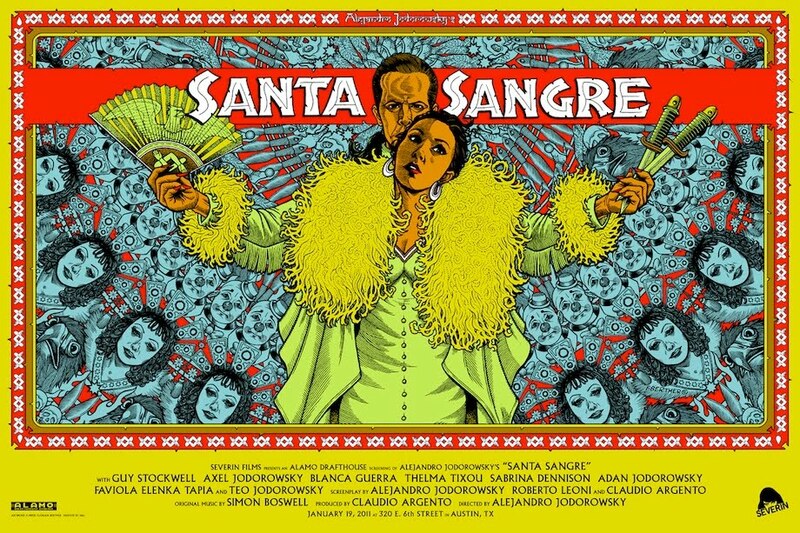 The Santa Sangre poster will be super limited run of 200. And will be available tonight at the screening at the Alamo Downtown and then tomorrow on Mondo’s website. With thanks to Mondo’s Justin Ishmael for this exclusive look." amazing/insane poster for an amazing/insane film. Can't believe this thing still hasn't sold out. It's gorgeous, man. Well done, again. Hab den Film 2008 in Cannes im Kino gesehen. War toll. Kannte ihn aber schon. Jodorowskys Sohn war da und hinter mir saß Nick Nolte mit seinem Sohn. Damals meinte er noch, dass King Shot im kommenden Herbst gedreht wird, inzwischen sieht's ja eher düster aus. Würde mich sehr freuen, wenn du mir unter nikias2000@hotmail.com kurz schreiben könntest. Hab sonst keine Email-Adresse o.ä. von dir gefunden. Tausend Dank und viele Grüße!